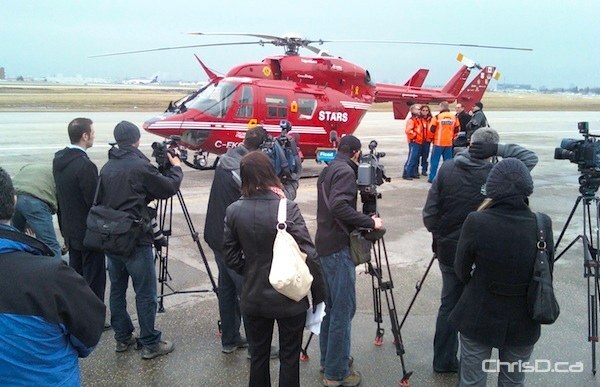 The Shock Trauma Air Rescue Society (STARS) helicopter ambulance will be flying above Manitoba in the coming weeks during the spring flood. The non-profit aircraft and its expert medical team will ensure the safe rescue and transport of anyone requiring medical attention, but cut off due to flood water. Manitoba is in the process of acquiring its own permanent helicopter medical-response program. The aircraft could help save 30 to 50 lives annually, Selinger noted. On Wednesday, the province showed off its aerial rescue team, equipped with the ability to rescue stranded residents whose roads may be inaccessible during the flood.